A few weeks ago I ordered and received one of my designed Artsprojekt products, “Circuit Death 3D” on a white t-shirt. It was nice but wanted to see how it would look like on a black t-shirt, so I ordered another one on black and a “Circuit Harmony” designed t-shirt as well. They both finally came in, and I’m really happy with them! I may be wearing both of them at New York Comic Con 2010 this year, so if you want to find me, now you know how! Also, the “AW177” on the back is a giveaway as well! I wish I had more time to devote to it, but those are some of my products for now! Help a starving (ok maybe not starving but hungry) artist out if you can and pick something up! Thanks!!! Toy Art Gallery – Jouwe Group Custom Show October 2nd! 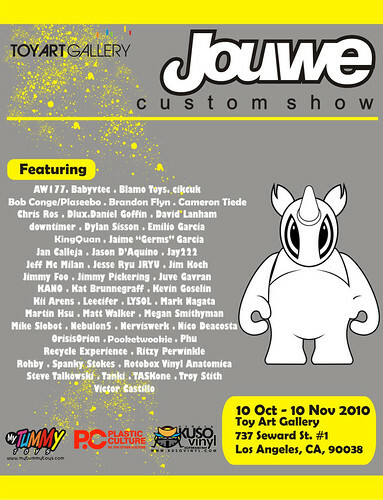 “Toy Art Gallery is proud to present the Jouwe Group Custom Show, opening October 2 2010. We’ve invited over 50 of the best custom artists around to work their magic on the 10″ Jouwe figure and we’re extremely excited by what we’ve seen so far. AW177 Work in Progress for New York Comic Con 2010! Got a few customs working for New York Comic Con 2010 – wanted to give a WIP shot of it. 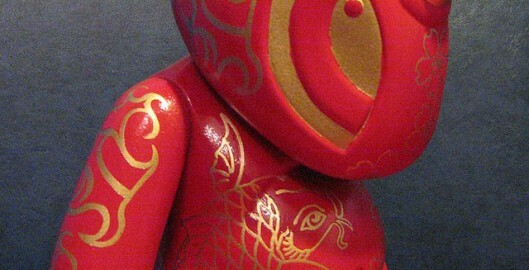 This is a collabo custom w/ a great sculptor, artist and friend of mine (revealed later). I wish I had more time to devote to it, but those are some of my products for now! Help me out if you can and pick something up! Thanks!!! Ok finally got a chance to snap a few pics of my custom “Koi Blossom” Jouwe figure for the Jouwe group custom show at Toy Art Gallery (TAG) located at 737 Seward St. #1, Los Angeles, CA 90038 (www.toyartgallery.com). Opening reception: October 1, 7-10pm, runs from October 1 – 29, 2010. The Jouwe figure is great and I didn’t want to modify the form of it; I wanted to enhance it and give it a more traditional Asian pattern. The Jouwe form looks like a tough yet cute little rhino guy, so wanted to give it a more ‘love’ feel to it – hence why I chose the Koi. Decided to order some minicards as my business card to give out to peeps who want my contact info, as well as create a small piece of art that people can put up or whatever to enjoy. I decided to get some minicards done, half the size of a regular business card, since they are pretty cool, unique and different than other business cards out there! Jouwe Custom Show – Toy Art Gallery (TAG)! New blog update! It’s been a while, but I’m back to updating and am posting up a new show I’m participating in – the Jouwe custom show at Toy Art Gallery (TAG), located at 737 Seward St. #1 Los Angeles, CA 90038. Show opens on October 2, 2010, so try to be there to see some beautiful custom Jouwe figures! Pix of my figure will be up soon!